Bureau B+B is proud to announce Gert-Jan Wisse as new member of our management-team. Bureau B+B is proud to announce the appointment of a new member of our management-team: Gert-Jan Wisse. Gert-Jan studied at Van Hall Larenstein and the Academy of Architecture in Amsterdam, and he has worked at Bureau B+B since 2008. He takes over from Mascha Onderwater, who has left the office. He and Jeanette Visser have formed the new team of directors since May. An important Bureau B+B tradition is to ensure continuity and innovation by combining extensive experience and young talent. Equal collaboration and sharing of knowledge are constant factors within the office in order to continuously generate fresh ideas for relevant assignments. 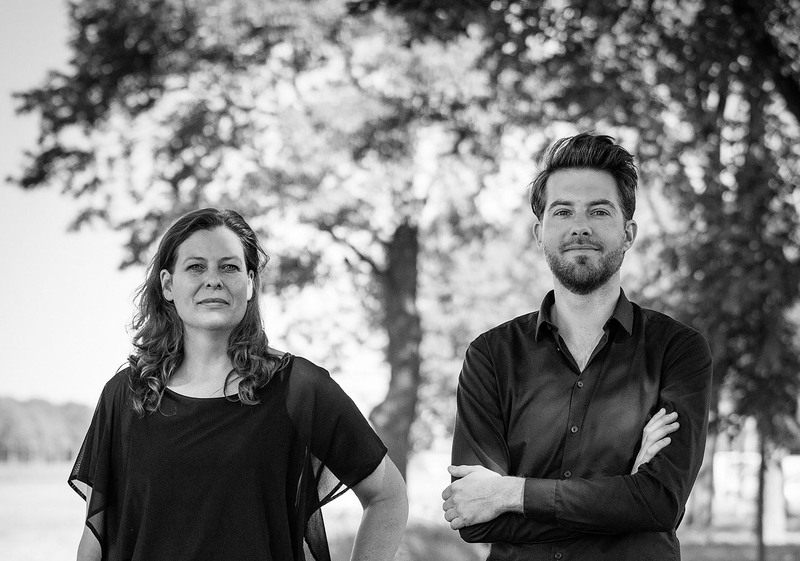 With its new team of directors in place, Bureau B+B is looking forward to an inspiring future. A conversation with Gert-Jan Wisse and Jeanette Visser. Gert-Jan is a fantastic designer who has developed strongly in recent years. He has the ability to translate a design into a story that can convince people. A good story sets everything in motion, driving the design and keeping everyone focused on the essence. When you make a design, it’s important to first take time to ask: How does the site work? What does its history tell us? And what are the real issues? The answers provide the starting point for a design that is anchored and that reveals the potential of the place. Jeanette has an exceptionally keen eye for the essence of a convincing story. In addition, in her twenty years at Bureau B+B she has built up tremendous experience in seeing projects through to completion. She knows how to mobilize craftsmanship like nobody else. We face challenges today not only in the area of climate change, but also in terms of social integration and physical and mental health. These are often essentially urban and landscape questions. Almost half the world’s population now lives in cities. And that percentage will continue to rise. The resulting wishes and claims are multiplying and have huge consequences. The housing market is overheated. We see that city centres are becoming increasingly commercial, and tourism is growing out of all proportion. Developments in the property sector are also growing rapidly, and the desire to improve spatial quality often conflicts with the needs of accessibility. The dynamism of the contemporary city therefore places fundamentally different demands on the public domain. You see that public space is often based on standard design, which covers things like street profiles for traffic access, parking ratios, management plans, policies for buying materials and so on. As a result, innovation lags behind. We think that public space needs to react to the changes in today’s cities. At the same time, there is a danger that the DNA of the site is lost. Cities are starting to look more and more alike. The same multinationals and retail chains occupy the prime sites, and the same cards seem to be played when it comes to public space. In the process, we lose sight of local characteristics and stories. We believe that a deep knowledge of the city is needed to design public spaces. How has it evolved? What is the local culture? This paradox, moving forward while staying connected to the identity of the place: that’s what we want to work on with an open mind every time. And how do you connect places to one another? It is very important to understand how a place forms part of the urban fabric. A good example is our 1996 plan for the city centre of Breda. It mainly involved connecting parts of the urban fabric — a park, the city centre and the station — that were too isolated. All of them are places that serve the local community in various ways. Connecting them to one another very precisely created a greater sense of vibrancy that has made the city resilient to this day. The 2015 transformation of the Mariahilferstrasse in Vienna is an excellent example of how this way of working can take on board current discussions about accessibility and urban mobility. We transformed the Mariahilferstrasse in the heart of Vienna from a busy traffic artery into a multifunctional, pedestrian-friendly public space. This is Europe’s longest shared-space boulevard and has become a crucial hinge in the city’s public space. The fact that the street had for decades been one of Vienna’s main shopping streets and easily accessible by metro provided a fertile basis for transformation. To achieve this, we had to make bold changes to the traffic structure. We wouldn’t have succeeded just by straightening things a little. We are now working on a similar project in the city centre of The Hague. This is a follow-up to an integral vision for the entire city center of The Hague, which the office made thirty years ago and is still in place today. We carried out a thorough study of historical layers in the heart of the city, the Spui-Buitenhof axis, to grasp the logic of the urban fabric, which often involves spatial stories. This form of urban anatomy is crucial to understand the source of problems in the current system of spaces and functions, and then to come up with proposals for improvement. This is also the way to ensure that all interests with a stake in public space, many of them conflicting, can be united. We feel especially comfortable tackling spatial problems that touch on many issues. That means we work with many different parties: stakeholders, local authorities, organizations, users — all of them with their own claims on space. You need a good story that brings together the identity of the place with the actors involved and the issues at stake. That same goes when introducing natural systems into the city. We increasingly realize that we need nature to keep our bodies and minds healthy, and to help us find solutions to the problems of climate change. We do this by translating old systems into new principles – connecting cultural layers with natural systems and circular processes. So, for example, don’t hide water out of sight in an underground pipe, but make use of it as a dynamic force with character. An example is the Wijkeroogpark where we took clear water from the dunes, which for decades had drained away into the sewer, and made it visible again by designing a new stream. We also connected the water from the stream with the North Sea Canal, thereby restoring the original transition from freshwater to brackish water, benefitting flora and fauna. For the recent renovation of the Citypark in Kerkrade, we made the most of opportunities that came from the site in a former dry valley. Channelling all the rainwater from the surrounding area allows the park to function as the centrepiece of a sustainable rainwater system. During heavy rainfall, a stream flows violently through the park, while on sunny days it turns into a play feature for children. The challenge for us is always to combine cultural and landscape systems to create resilient places full of character – rooted in the past, yet focused on the future.